Johannes Gutenberg University Mainz (JGU) and the University of Burgundy in Dijon in France give a new impetus to international teacher training. In the 2017/2018 winter semester, Mainz will launch a binational Master of Education degree program unique in the range of the subjects it will cover. "Our new Master's degree program merges seamlessly with the existing Mainz-Dijon teacher training Bachelor's degree program and is a further important component of the Franco-German degree program syllabus at Mainz University," emphasized Professor Georg Krausch, President of Johannes Gutenberg University Mainz. The University of Burgundy is JGU's most important partner university and is the foreign university with which Mainz University maintains the most extensive exchange program. Over the past 25 years, the universities of Mainz and Dijon have developed shared degree programs in teacher training, in the humanities and cultural studies as well as in political science and law to enable students to study both in Dijon and Mainz and acquire both a German and French university degree. All the degree programs have been positively evaluated by the Franco-German University (FGU), which also provides mobility support to the students during their time abroad as part of the exchange program. "There have been more than 1,000 graduates of the program to date. This indicates our contribution to promoting partnership and friendship between Germany and France and we will continue to support and promote this binational university cooperation over the long term—and even more so in times when Europe faces enormous challenges. We are particularly gratified to be able to focus on joint teacher training in collaboration with our partner university in Dijon and thus help install the spirit of Franco-German understanding in the education of young people," added Krausch. "Johannes Gutenberg University Mainz is the most important partner of the University of Burgundy, with an exchange of hundreds of French and German students every year. This demonstrates the great success our partnership that began forty years ago with a simple cooperation agreement," said Professor Alain Bonnin, President of the University of Burgundy. The so-called integrated joint degree programs are at the core of the cooperation and benefit from the valuable support provided by the Franco-German University. "The very first of our universities' joint degree programs recently celebrated its 25th birthday and has already produced more than 400 French and German graduates, who now teach in the language of the partner country in the schools of both our countries. Our cooperation serves as a model for other institutions looking to establish new links within and outside of Europe," emphasized Bonnin. Johannes Gutenberg University Mainz and the University of Burgundy in Dijon have assumed a pioneering role in transnational teacher training. In addition to the launch of the Master of Education degree program for graduates of the Mainz-Dijon integrated Bachelor teacher training degree program in the 2017/2018 winter semester, both universities are also planning a binationally recognized teacher traineeship for teaching degree students. 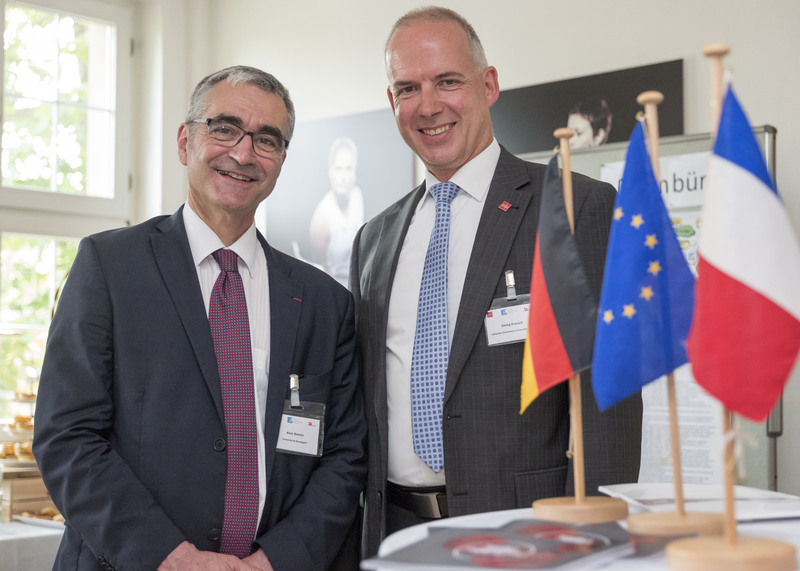 A Franco-German work group is already designing the Franco-German teacher traineeship which will be the first of its kind in Germany at secondary education level II. The work group includes representatives from both of the universities and non-university institutions such as the Rhineland-Palatinate Ministry of Education, the State Seminar for Teacher Training for Secondary Schools, and the Rectorat de Dijon. During this year's partnership meeting in Mainz, the JGU President presented the university's Medal of Honor to Dr. Lutz Baumann in recognition of his many years of commitment to the program and his voluntary service as head of the JGU Dijon office. "We thank you for your remarkable support of the Dijon office at Mainz University over the past 30 years. What started as a relatively simple task is now an institution admired and watched with interest by numerous other institutions outside the local and regional context," emphasized JGU President Professor Georg Krausch. 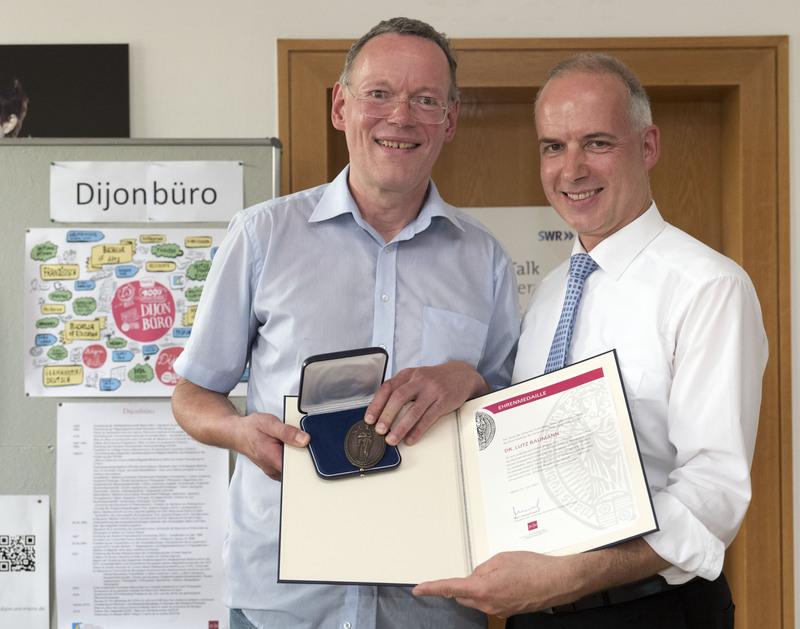 JGU President Professor Georg Krausch (r.) presented Dr. Lutz Baumann (l.) with the Johannes Gutenberg University Mainz Medal of Honor in recognition of his years of voluntary service as head of the JGU Dijon office.